About twenty volunteers from our Rotary club have been travelling to islands of the Philippines for the past 22 years to conduct our medical mission to restore sight and hearing. It’s a whole new project on a different island every couple of years. One of the common needs, identified through our contacts with the many sister Rotary clubs we work with in the Philippines, is their need for assistance after the frequent devastating typhoons and earthquakes in that country. We also witness significant malnutrition, particularly in the children of the poor villages that we visit. Our Club President for 2016-17, Doug Hawley, runs a food manufacturing business that has the export licences that allow us to run this project which is called FORaMEAL. 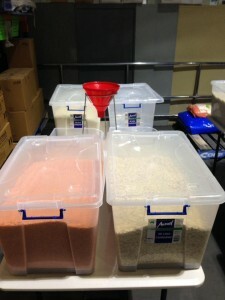 In an evening of volunteering, our members can pack 800 meals, that will feed 4,000 people. Strict procedures are required to ensure we comply with the food handling regulations, but it’s quite fun to dress up in the gowns, hair-nets, gloves and foot covers. Several assembly lines are formed and each pack is weighed to ensure it contains the correct mix of ingredients, before it is thermatically sealed. The completed packs are then boxed up ready for shipment. 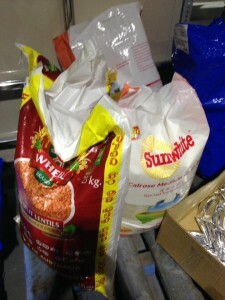 The aluminium heat sealed packs consist of lentils, oats and rice with a sachet of the important minerals and vitamins. 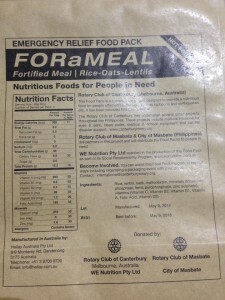 These packs are shipped to Rotary clubs in the Philippines and stored in a vermin safe area for distribution, following the inevitable natural disasters that occur in their province. At the end of the shift, volunteers meet to share a meal. 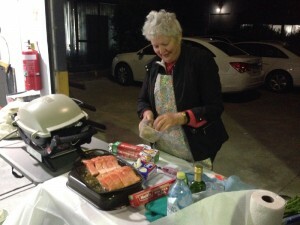 Club President 2015-16, Nora Ley, did an outstanding job catering at a recent project, with a barbecue of marinated chicken, baked salmon and gourmet sausages. The FORAMEAL project is developing into one of the Club's most significant activities and fundraising streams. Fun emergency food packaging events have been held with other Clubs, at the 2019 Multi-District Conference and hopefully in the near future with corporate organisations. The Club has launched a separate FORaMEAL website (please click here) and a Meetup site (please click here) for anyone interested in volunteering at an event or assisting with the project. Sincere thanks to WE Nutrition Pty Ltd for sponsoring this project. Rotary’s Disaster Aid Australia (DAA) delivers innovative Australian-based humanitarian aid solutions to people in developing countries who have suffered loss following natural or other disasters. Specifically, DAA provides families in desperate need with shelter, materials, water and light – and a new start within their communities, with hope and dignity. Importantly, DAA does not go in and “tell” people what they need, drop aid packages and then depart. In the Philippines for example, we quickly learned it was not tents they needed, but what we now call ‘home repair kits’ that the local people told us were vital … and, highly practical. Read more . . .
Each year our club supports the work of DAA with a donation of $2,500. After Typhoon Yolanda, we sent an additional $10,000 directly to our sister Rotary Clubs in the Philippines so that purchases could be made to help them to not only repair homes, but also to reestablish their local economy. 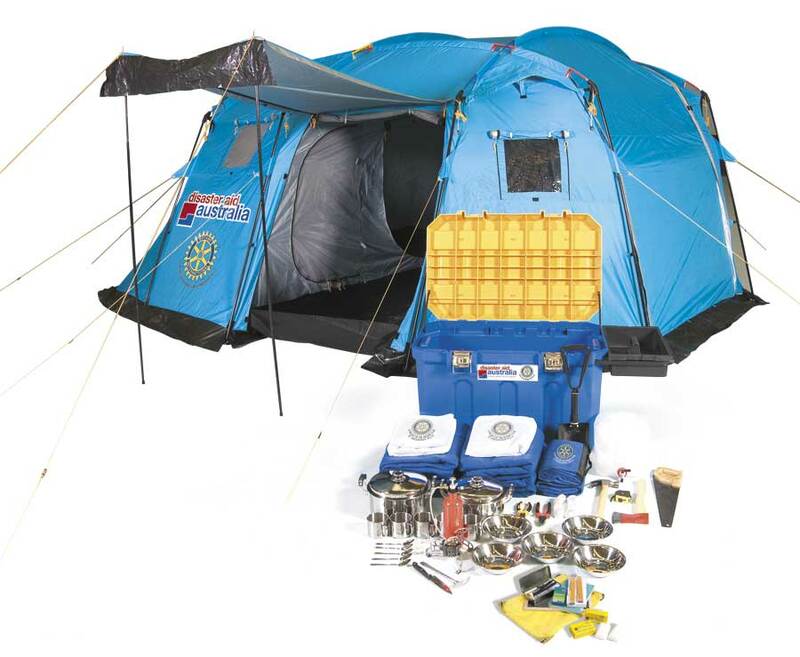 A Family Survival Pack provides a family with the basic tools to rebuild their lives. For ease of transport and manoeuvrability, the box has wheels and a handle. Its capacity is 190 litres, with the lid serving as a carpenter’s workbench with two 2”x4” saw grooves, and is completed with a tool holder. Inside the box is a range of support items, most importantly, the Disaster Aid tent which is the largest humanitarian aid tent available. And best of all, it is inter-connectable. Simply, we can erect a four classroom school for up to eighty school children; assist with a first aid tent; erect a community centre – the deliverables are many and varied dependent on the need of those we serve. Filled with blankets, water containers, cooking utensils, a stove, pots, pans, children rucksacks (with books and pencils), mosquito nets and other useful items, our packs help rebuild broken lives.